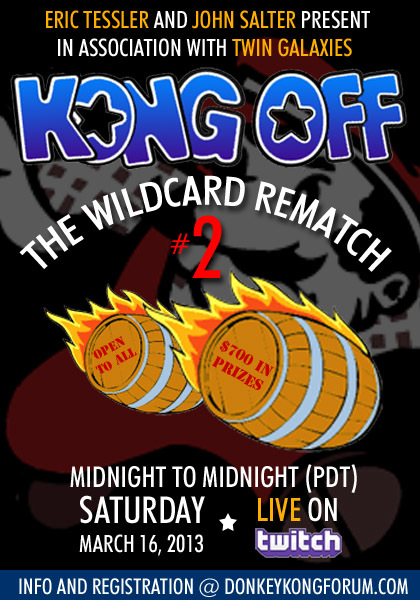 January 7th 2015 - It's 6:00 PM Pacific time, and the starting gun just fired on the sixth and final event in the Donkey Kong Online Open tournament series, which began in March of last year. 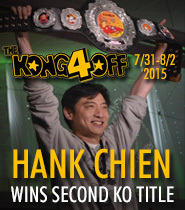 At stake is the seeding for the upcoming Kong Off 4, which will be determined based on the aggregated scoreboard from all six events. Perhaps of more interest to competitors, though, is the considerable stack of up-for-grabs cash! This time, pay spots will extend beyond the usual 3, all the way out to 10, with a total of $1,150 shared among the top 10 finishers, and an additional $250 worth of "mystery bounties" to be given out to five randomly-drawn finishing spots. All eyes will be on the game's best players during the next four days, as they pursue an unprecedented world record bounty of $3,000. Recent but uncomfirmed chatter has it that, with this much money on the line, MAME record holder Dean Saglio has decided to make his way to an arcade cabinet. If Saglio does so, I would give odds of at least 4 to 1 in favor of there being a new world champion by Sunday night. 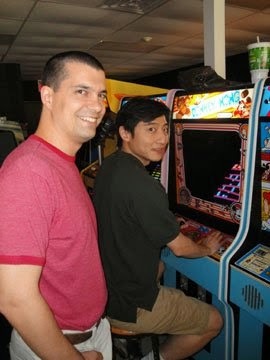 Saglio beat Robbie Lakeman's recent arcade world record in the MAME emulator almost four years ago (and has crushed it in the time since). 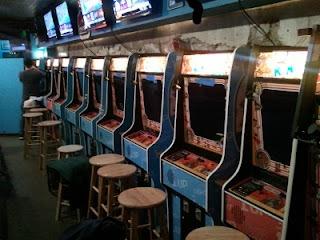 For Saglio, if not anybody else, the arcade record is a relatively soft target. 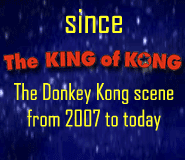 Breaking the record in this timespan, however, still depends on a synergy of elements: the Kong Offs and online tournaments have demonstrated again and again that with Donkey Kong there is no certainty in the short term. Mental and physiological factors in the player, along with the randomness in the game, all have to cooperate. There's no guarantee that four days will be enough. If Saglio doesn't do it, there will be others trying, including Lakeman himself. 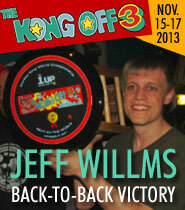 A Jeff Willms sighting was noted within the last hour. In fact, Saglio was heard to remark that we should be "disappointed as a community" if the record is NOT broken by the end of the tournament. I would not go that far, but expectation is high indeed! If the Donkey Kong Online Open #6 seems to be getting more hype than normal, it's not just because its the biggest Donkey Kong online tournament ever (more than 80 entrants and the largest prize pool yet), but because it will be the last one for the foreseeable future. 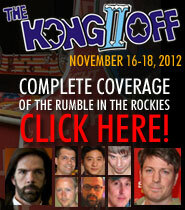 where Ross Benziger went "back to back"
Organizers Eric Tessler and John Salter have hosted all tournaments thus far, of which there have been a total of 11 events in three series (the Kong Off 2 Wildcard Rematches in 2013, the Kong Off 3 Wildcard Qualifiers also in 2013, and the current Donkey Kong Online Opens). Tessler and Salter announced when registration for DKOO#6 began that it will be their final event. And so, the "cult of Kong" will be out in force for these 99 hours, giving their best effort and raising their hammers high for the generous, hard-working team who brought us so much fun, and so many great memories, over the past two years. This one's gonna be huge! Poor Robbie, he's going down!